"Planton-Ukraine" one of the few who carries out consolidation of modular cargoes in the European warehouses from Spain, Switzerland, Italy, Belgium etc. Warehouses are specialised premises a total area on 120 000 m. sq. and corresponding technics (cranes, loaders etc.). We offer a spectrum of services in accompanying service such as insurance, customs registration of cargoes. Staff of our company is rallied and operating team of the adherents having a long-term operational experience in transport sphere. In a telephone mode you can receive consultations on any interesting a question. Our main priorities: quality, mobility, informationality of service and an individual approach. Among our partners there are 70 % - big foreign companies and approximately 30 % are the Ukrainian companies - residents of Ukraine. These are cars of various types: awnings, refrigerators (supporting a temperature mode), all-metal. 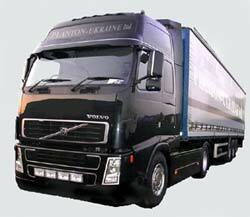 Our company carries out transportation of cargoes according to TIR Carnet and dangerous cargoes ADR all classes 1-9.